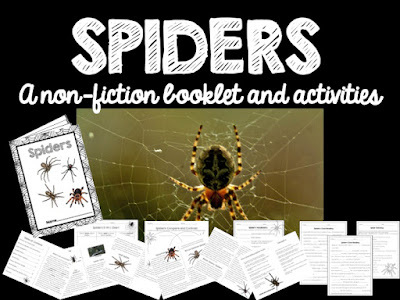 The Best of Teacher Entrepreneurs: Language Arts - "Spiders: Non-Fiction Booklet and Activities"
Language Arts - "Spiders: Non-Fiction Booklet and Activities"
Here is a fun "non-scary" booklet to be used for Halloween or any other time when learning about spiders. • What is an Arachnid? • What do Spiders Eat (and What Eats Spiders)? Directions for assembling booklet are included!